My tree-planting has had mixed results. When we moved into our current house, some 14 years ago, there was only one tree on our two-thirds of an acre. It was a water oak and it stood in front of the front door, barely as high as the eaves of the house. Since then, its tap root has struck water and it's taller than the house. And it is no longer the only tree. We have red oaks, crape myrtles, Bradford pears (which bear no fruit), quinces (which do, but nobody would eat it), a Rose of Sharon, three Arbor Vitae, and one weedy no-name thing that volunteered and shows signs of eternal life. All these are doing well, and put forth blossoms in season, and are alive with nesting birds in Spring and Summer. This is gratifying. The first time I tried to get trees to grow did not work out so well. Back in my youth, when I lived in Chicago, a friend of mine named Charles had a "farm"—the quotation marks indicate that he was no farmer, he just owned some country acreage—in Wisconsin. Several of us used to drive up there for weekend camping trips. Once in a while we would make feeble payback efforts for our friend's hospitality by doing a few chores around the place. Since no actual farming went on, this was seldom enough to make us work up a sweat. Until, that is, our friend got a Good Deal on some red pine seedlings. All the freeloading campers were issued shovels and instructions, and we bent and grunted, hacking the tough soil, unplowed for decades, making sockets for the little trees. Then we went down the rows, doubled over, putting the seedlings in the holes, carefully replacing the soil, patting the little hills of dirt until they were just so. Never have seedlings been planted more By The Book. This was years before the world knew of Martha Stewart, but she would have smiled upon our technique. It was, of course, the hottest day of the entire Summer, and if it wasn't, it is now, in my memory. My back still hurts from time to time, and I am certain the trouble started on that day. But by the late Summer dusk, we looked at those rows of little pines and smiled. Generations yet unborn, we knew, would be shaded by these trees. We put away our tools, wiped off the worst of the sweat, and got pig drunk. Life was good. Until a couple of weeks later, that is, when Charles next visited his country retreat. He found, and he lost no time telling us, that every single seedling had been bitten down to ground level by deer. All gone. Phhht. That was about 30 years ago, and I seldom think of it, except when I eat venison. The deer I eat these days in Texas are unlikely to be any kin of the ones who ate our pine trees, but I don't care. They taste better when basted with salsa di vendetta. Revenge is a dish best served cold. Anyway, my tree-planting obligations to posterity are in better order these days, and that leaves procreation (too late) and publication. Here things are looking up. I have, at last, in my old age, published a book. Not a very big book, but an honest-to-God book, with covers and illustrations and a Table of Contents and its very own, entirely unique, ISBN number. Until now, I was just a Writer. Now I am an Author. Now I can say "my publisher" without a hint of irony. And I can identify the publisher without a hint of apology. 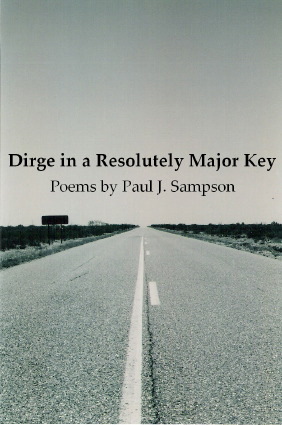 My little book, a small collection of poems called Dirge in a Resolutely Major Key, is published by Unicorn Press. The Unicorn Press backlist, nearly all of it still in print, includes many important books by world-renowned authors. Mr. Brilliant has just issued the 40th Anniversary Catalogue, listing 121 titles. It's a treasure map. From its beginnings in 1967, Unicorn Press has produced beautiful editions of contemporary US poetry and translations of 20th Century German and French poets. They have published books by such writers as Teo Savory, Philip Levine, James Tate, Robert Bly, Kenneth Rexroth, Dan Berrigan, Thomas Merton, Fred Chappell, Marge Piercy, and Fred Turner. With foreign material they've ranged from Vietnamese poems by Thich Nhat Hanh and Vo-Dinh to Horst Bienek's "The Cell" and Ulli Baler's "Words of Paradise," poetry of Papua/New Guinea, the Moroccan courtesan Mrida, and Thomas Merton's translations of poems by the Nicaraguan poet Pablo Antonio Cuadra. Recently, Unicorn Press has brought out a new series of chapbooks of poems, collections of stories, and translations by a variety of authors. As always, the editions are individually designed (there is no "house style") and are carefully made by hand. The craft of bookmaking is an important part of the Unicorn Press mission, as important as selecting good texts to publish. The new chapbooks, including mine, are inexpensive; you can see what I'm bragging about for $11.95, postage included.